The Spanish wine region of Ribera del Duero is one of the most prestigious wine producing areas in the world. If you love big, red wines, this is the region for you! Ribera del Duero’s vineyards blanket across the Duero river’s banks (the most famous wine river in Iberia, called the “Douro” in Portugal). This is the land of the “Conquistadors” and castles and ruined fortresses punctuate the dry arid landscapes throughout the region. The most impressive is Peñafiel, shaped like a battleship and located majestically on the top of a craggy hill. Mythical wines made here include Vega Sicilia, Pingus, Abadia Retuerta, Pesquera, Viña Mayor, Emilio Moro, Carmelo Rodero, Pago de Carrovejas, just to name a few. The famous “Golden Mile” in the Ribera features some of these wineries and some of Spain’s most expensive wines. You will have the opportunity to taste many of these wines and see where they are made. We have created this wine tasting tour for those looking to taste the fabulous wines from Ribera in their birthplace, and the wine country tour is combined with a visit to the Madrid, Europe’s best-kept secret. On this gourmet wine tour, you will enjoy VIP private winery visits to such renowned estates as Abadia Retuerta, Emilio Moro, and Pérez Pascuas. Apart from wine tasting; you will visit breathtaking monuments such as the 13th-century Gothic Cathedral in Burgos; enjoy delicious regional cuisine in charming, cozy restaurants; and sleep in a wine hotel right in the vineyards. In Madrid, you will have a fabulous Spanish wine masterclass paired with Basque Pintxos. If you love food, wine, and culture and are looking for a memorable wine tour in Spain, contact us for more information. Arrive at Madrid airport and your elegant chauffeur guide will be waiting for you, to sweep you away to the wine country. The drive is just over 2 hours, so sit back and rest. You have a full day ahead! Arrive at the first wine estate such as Emilio Moro, making elegant and refined wines. After a short tour of the winery, you will have a private tasting of all the flagship wines such as Finca Resalso, Emilio Moro, and Malleolus, plus a special cru like Malleolus de Sanchomartín will be waiting for you to taste and savor. After this first winery visit, you will be ready for lunch and we have an atmospheric venue for you next in Peñafiel. In a historic wine cave, you will taste authentic, local specialties like suckling pig, roast lamb, piquillo peppers and homemade desserts, all paired with fine wines like Pesquera Reserva. After lunch, why not take a digestive walk and visit Peñafiel, with its fairytale castle. Then carry on to the second winery of the day, to beautiful Finca Villacreces. After a stomp in the vineyards, you will explore the wine estate on a private tour and conclude with a tasting of their range of exclusive wines including a top Reserva. Finally, you will head to your ultra luxury wine hotel, set amid the vines. You will have great views and a comfortable, stylish room. Dinner is on your own at their excellent restaurant, in a gorgeous dining room. Welcome to the Ribera del Duero! 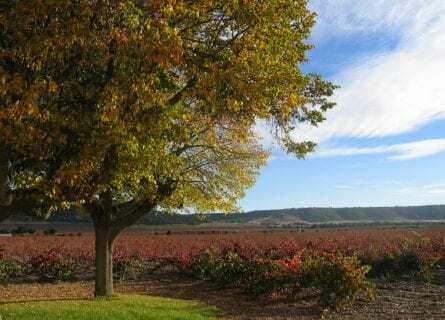 This morning you will drive through the Ribera Winelands to one of the main hubs, Roa del Duero. Begin the day with a private tour and tasting at a renowned estate like Perez Pascuas, producers of the Viña Pedrosa range of wines. Taste 4 wines including the “Gran selección” made with 100% Tinto Fino (Ribera del Duero name for Tempranillo). Then continue on with a charming and intimate experience at Lopez Cristobal where you will enjoy a rare owner led tour and tasting. The highlight of the weekend! From Roa del Duero, you will drive north to Burgos, where the folkloric hero El Cid is buried in a jaw-dropping Gothic Cathedral. First up is a late lunch at one of the town’s famed “Asadors”. Traditional food served by elegant waiters in an upmarket Castilian restaurant, very good. You will taste some superb wine with lunch such as Vega Sicilia’s Valbuena! After lunch, you will have a few free hours in Burgos to visit the old town and the cathedral (which easily merits an hour; it’s huge and gorgeous!). 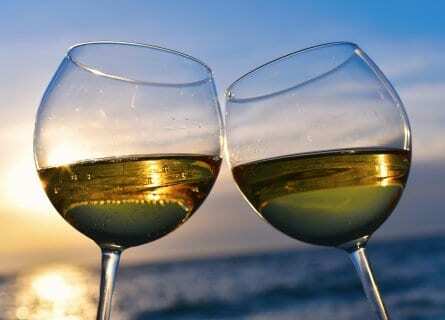 In the evening, return to your wine hotel and enjoy the rest of the night at leisure. Relax at breakfast and take in the views of the vineyards. These views are stunning at harvest time! Today you will enjoy your last wine estate of the weekend, the stunning winery on site. Novelties this morning include a 4X4 tour through the vines and a tasting in the 13th-century chapel. You will enjoy the ultimate VIP tour, lasting about two hours. Abadia Retuerta makes some of Spain’s most exciting wines and you will try their best ones including Abadia Retuerta Selección Especial, Palomar Cru, Pago La Garduña Cru, and the Pago Negralada Cru. Sublime wines and you will enjoy them with a hearty brunch of homemade Spanish tortilla, manchego cheese, and nutty jamón. Then you will be driven back to Madrid. Drop off your luggage at your hotel and check in, and the rest of the afternoon is yours at leisure to discover the famed art museums (Prado, Reina Sofia, Thyssen), do some shopping (Madrid has great shops for leather, gourmet goodies like saffron and olive oil, clothing and shoes). Dinner will be on your own with our suggestions today. You could go “tapas hopping” in the Cava Baja or around the Opera House and Plaza Oriente, or sit down to a creative tasting menu at one of our favorite spots like Caoba, Viridiana or the Gastroteca. 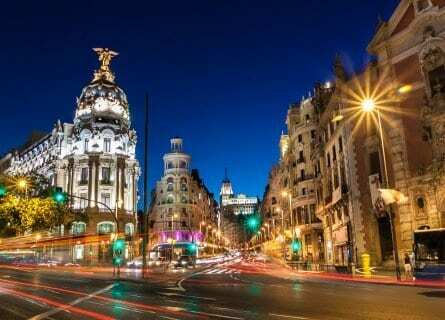 This morning, your chauffeured Mercedes will take you back to Madrid’s Barajas airport at your preferred time. And this concludes your short but thoroughly entertaining wine tasting tour in Ribera del Duero and Madrid. We look forward to seeing you again! Out of this world! Truly, we are so blessed to have had the privilege of being a guest of Cellar Tours! Years of travel and reading guide books still would not have held a candle to the carefully, thoughtfully planned tour. Much consideration was given to the guests from interests to activity level to food & wine preferences. Truly no detail was overlooked. Each of the wineries was very different and special. It was great to make the drive because you could better appreciate how the changing landscape influences the vines/wines. We know there is no way in the world we would have known where to go, have found the bodegas or have been welcomed into the fold or have been given access to such special and fabulous wines. It’s the single most, amazing, special, fabulous, memorable vacation anyone could take! I do think it is unparalleled in the design, the scope the details, the balance, the quality.